Presente | NY Times, Do Not Call People "Illegal"
NY Times, Do Not Call People "Illegal"
For the first time in decades, we have a chance to change the way the media talks about immigration. Pulitzer Prize-winning undocumented journalist Jose Antonio Vargas has put a lot of pressure on The New York Times in recent weeks to stop dehumanizing immigrants. ABC, NBC, CNN, The Huffington Post, The Miami Herald, and many other news agencies have already stopped describing human beings as "illegal." Journalists within The New York Times have publicly voiced their disagreement with their own newspaper's policy on the term. Even Fox News Latino uses the word "undocumented" instead of "illegal." 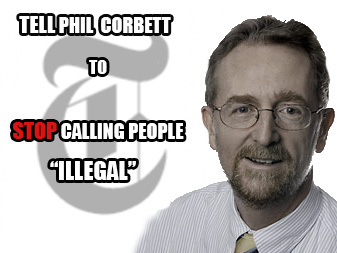 Philip Corbett is one of the editors responsible for calling people "illegal," and he has been one of the most ardent defender of the term. Tell him you want The New York Times to stop calling people "illegal" now. UPDATE I: The Associated Press just dropped the I-word and The New York Times is considering changes. Now is the time to push. Can we get 10,000 people to tell the NYT to stop calling people "illegal?" UPDATE II: Amazing! We just passed our goal of 10,000 people. Can you help us reach 15,000? The New York Times needs to join ABC, NBC, CNN, The Miami Herald, and many other news agencies in ending the practice of calling human beings "illegal." That word is dehumanizing, racially charged, and inaccurate. The fact that immigrants and Latinos find the term "illegal" to be dehumanizing and racist should be reason enough for The New York Times to change its policy. As the newspaper of record responsible for informing the public on complex immigration issues, you should be particularly concerned with the fact that both linguists and immigration lawyers agree that the term is inaccurate. You recently wrote in an email, Mr. Corbett, that you don't want The New York Times to "lead or be in the vanguard of promoting or spreading changes in language." We're not asking The New York Times to lead, we're asking the newspaper to catch up with the tide of history.